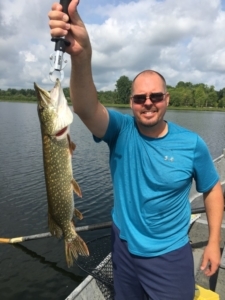 While on vacation, we managed to tangle with several different fish over the week, including this Pike that friend Ryan got off a weed line at “the lake”. Summer Smallmouth bass and Northern pike are the them to the Muskegon river fishing report for August 13, 2018 in the Newaygo, Michigan area. With river levels at an unprecedented low level for this time of summer, navigating the river to GET to fishing spots has been the biggest challenge, but we’re getting there ! With some possible rain coming this week, we may see river levels change a little. My apologies for lapse in time between reports, I took some family time to vacation with wife and kids before the onset of the 2018/19 school year begins. Had fun, boys got into some panfish and bass and a great getaway with family and friends. With summer winding down, many anglers thoughts shift to early fall and for those looking to battle some beasts in the river, CHINOOK SALMON are coming into their natal rivers on their annual spawning run. I begin guided trips on the Pere Marquette river next week, where we’ll be casting-retrieving lures to these vicious big lake fish, some of by the way are running REALLY large this summer. Click HERE for information on the Pere Marquette, including seasons, lodging options and general information. With both fly fishing and spin tackle equipment, we’ll pursue these great lakes big game fish through much of September, before switching to fall steelhead come mid to late October and fish them right up to the New Year. Water levels are at a point that I’ve never seen reached AND sustained…..we’re bone dry ! Click HERE for current Muskegon river water levels information. Present flows just above 900 cfs, with “normal” in the 12-1300 range and water temperatures in the 72-73 degree range.